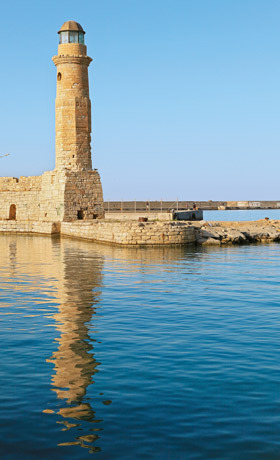 Capture Rethymno’s lost moments in time by following one of the many scenic routes around the picturesque city centre. Start from Arkadiou Street, where you can follow a unique cultural route crossing Rethymno's historical centre from east to west. The Venetian Fortress- Rethymno's landmark, the renowned “Fortezza” that stands imposingly on the hill of Paleokastro overlooking the Cretan sea, as well as the impressive cityscape. Here you can admire beautifully preserved buildings, such as the armoury with its four arched openings, Erofyli theatre, the ruins of the Episcope Palace, the Mosque of Sultan Ibrahim, and the Holy Temple of St. Theodore of Trihinas. 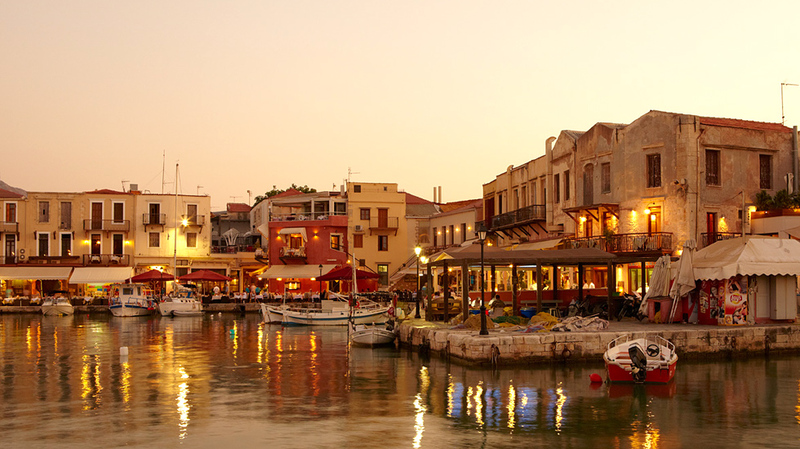 Continue to explore Rethymno until you reach the old Venetian Harbour that you will love. 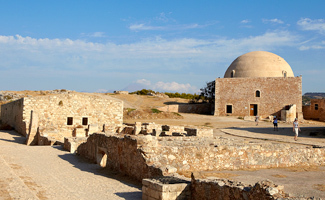 It is located 20 km of Rethymno in a lush green landscape full of oak trees, kermes oak trees, pine trees and vineyards. Built in 1587, its architecture is influenced in various ways by the early renaissance, the gothic and classic style as well as the early baroque style. At first, it acquired reputation as a center for copying Greek manuscripts, a work the monks of the monastery had been in charge of. At the same time, it was also renowned for the elaborately embroidered canonicals it produced. 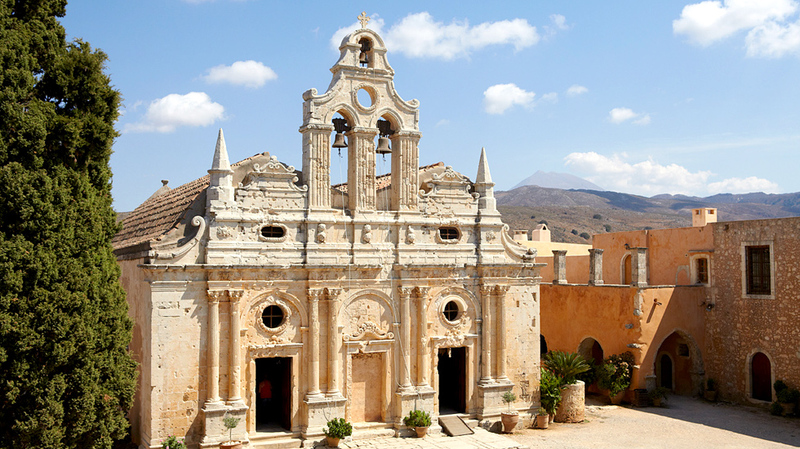 The monastery hosts a museum with an exhibition of findings from the "Arkadi holocaust", heirlooms, weapons, icons, an ossuary, etc. You will be delighted with the magnificent view of the Libyc Sea. You can admire the wood carved chancel with religious icons that are real masterpieces and represent scenes from the Bible in a detailed way. Some of these icons date back to 1750. The catholicon of the monastery is a two-aisled popular art church, built in 1836. It hosts the old abbey, which is used today as a guest house. You will also find a small museum exhibiting religious icons that date back to the 19th century. There are also interesting documents dating back to 1798 as well as the ledgers of the monastery dating back to the 19th century. Sfendoni Cave is located near the village of Zoniana at a distance of just 52 kilometers from the town of Rethymno. It is one of the most important caves in Greece, covering an area of about 3.000 square meters. The cave’s unique and rare beauty mesmerizes everybody, establishing it as one of Crete’s most beautiful caves. Visitors are allowed to explore a route of about 270m, along which they can admire a variety of impressive formations. Large columns create labyrinthine compartments inside the cave and stalactites and stalagmites of different colours and shapes decorate the cave’s chambers. 55 km from Heraklio at an altitude of 1100m on Mount Psiloritis. The sacred cave on the Nidha plateau, Rhea hid her son Zeus to save him from his father Kronos. Archaeological findings include bronze statuettes, bronze shields and offerings to Zeus, the father of all gods. Nearby are two springs, Zothimos and Kanithos, that keep their pre-Hellenic names. 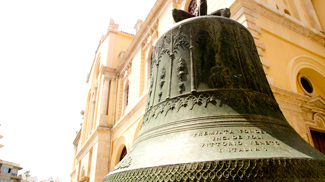 Rethymno’s landmark and its most important monument. Its dominating position on Paleokastro hill complements that extra charming picture of the city that always seduces visitors.